We’ll be tipping the sandglass over into the coming month, and tipping a few libations, too. We continue to trust that Spring will do just that, while being grateful for the generous precipitation we have received recently. I’ll play two sets, between 6 and 8 p.m. unless I play one long set. 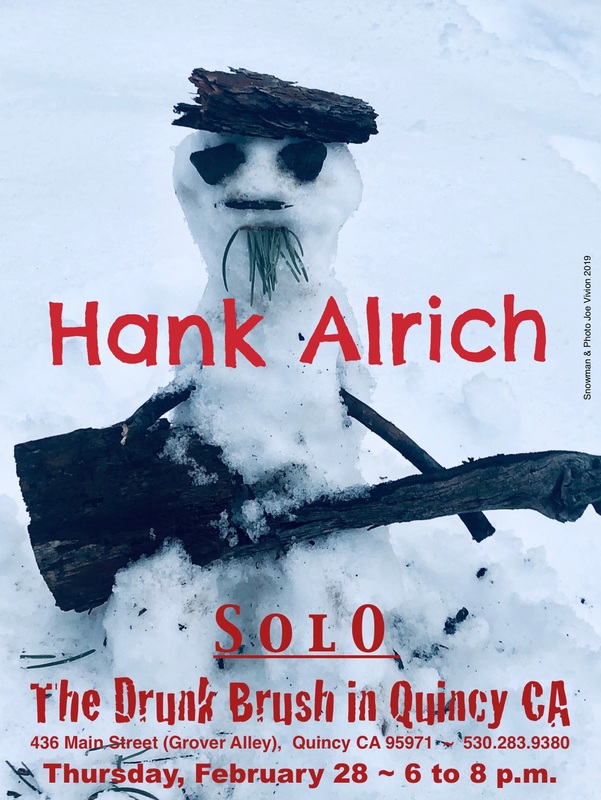 I have been having a wonderful time playing this residency so close to home, at The Drunk Brush Wine Bar on Grover Alley in beautiful greater metropolitan downtown Quincy, California. The libations are superb, the laughter infectious, the conversations rich. What a lucky thing for my community to have this focal point. Folks seriously into listening to songs have been taking over the far/star end of the room, while those who seek easy conversation hang at the bar end of the room. There’s room between for people who like to have one ear on each of both ends of the room. This is defined as “win, win, win”, AKA “a real good deal”. Fine sandwich and other fare is available from The Knook, which adjoins the scene. If you find yourself wanting to stay over in Quincy, a contender as one of the coolest small towns in the USA, consider the Quincy Courtyard Suites, which offer efficient walking distance access to many of the town’s delights.